Hello there. 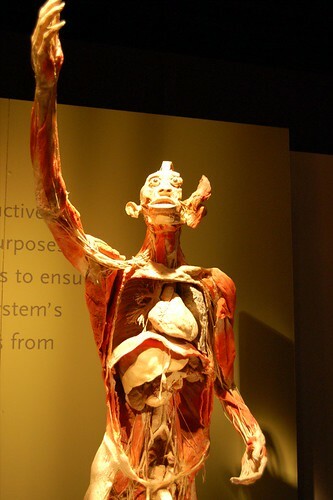 So after brunch and all, we went to the Bodies Exhibit down in South Street Seaport for a real life look at some bodies, organs, and anatomy. It was pretty amazing, so much that many of us didn't really believe what we were seeing. 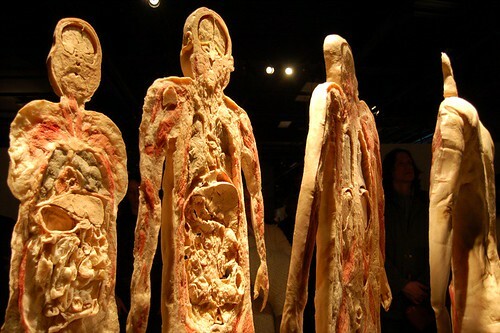 So all the bodies are real, preserved, and shipped from China. Most were convicts or just unclaimed bodies in the morgue. 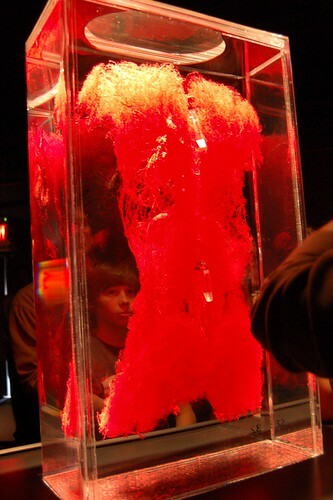 The whole glob of human blood vessels, kept in tact in a liquid. This is a "fat woman" dissected into 4 bits. I was so blown away at first, but now it just looks fake in my picture. 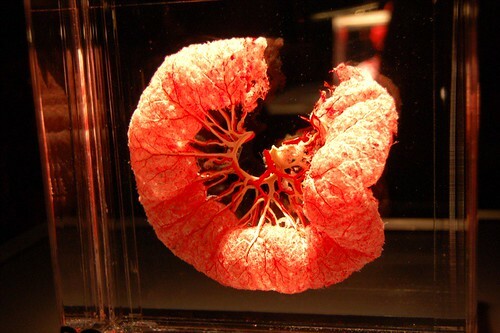 But mind you, that's real fat, intestines, liver, spleen, kidney, brain, et al you're seeing. Now, what does one do after examining bodies for 3 hours? Why, eat, of course. We were in the mood for dumplings, but discovered that Rickshaw was closed for "spring cleaning." Except that no one was cleaning, we were hungry, and they were closed. So we defaulted to Koreatown and had pinkberry. Because they don't allow pictures, I'm always adamant about taking surreptitious ones. 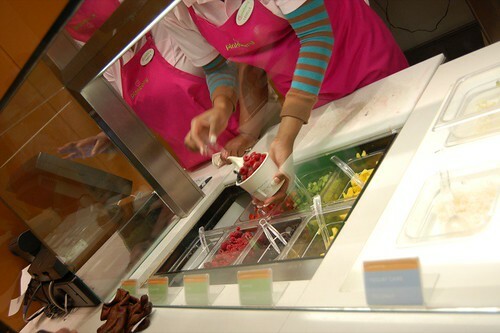 Here is a picture of the fruit toppings, right before they called me out and I ran away. Sugar Sweet Sunshine & Clinton St. Baking Co.
After our night at Kyotofu, we awoke the next morning in the mood for a carb-loaded brunch. Of course, we really weren't inherently that spontaneous, because I had planned out our meals for hte weekend prior. We hopped down to the Lower East Side for brunch at the Clinton St. Baking Company, which is known for their fantastic brunch. When we arrived at noon, we were told to wait for two hours. Since we had to wait for two others to arrive, we decided to eat there anyway. 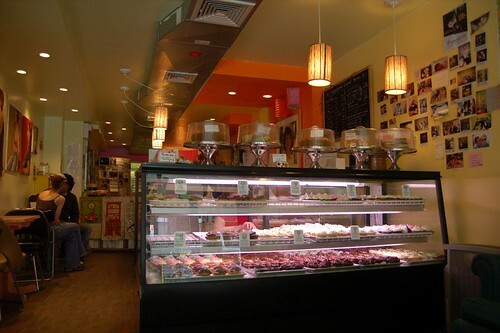 But given the sugar-loaded dining options in the area, I decided to indulge in some cupcakes at Sugar Sweet Sunshine. I ordered a lemon yummy, and Y ordered a pumpkin. 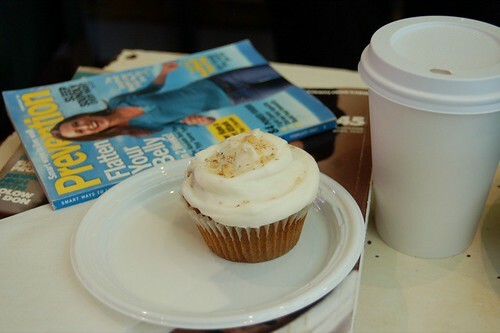 Though I am not particularly a fan of cupcakes (I prefer muffins), my lemon yummy was indeed quite delicious. The cake was moist, the buttercream fresh and not too sweet. I found the Prevention magazine in the background and the cover article "Flatten Your Belly" a bit ironic for what we were eating, but I suppose we're rebels in that sense. 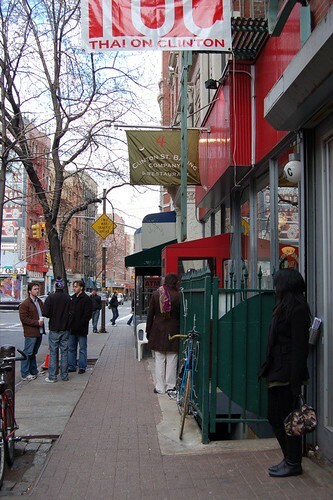 We returned to Clinton St. Baking Co. at 2, and still had to wait for another 10 minutes. This is even more ridiculous than Canteen. My favorite thing about the benedict was that they came on the flakiest, softest biscuits. I did not really know what I was missing out on, since I usually have them on English muffins. 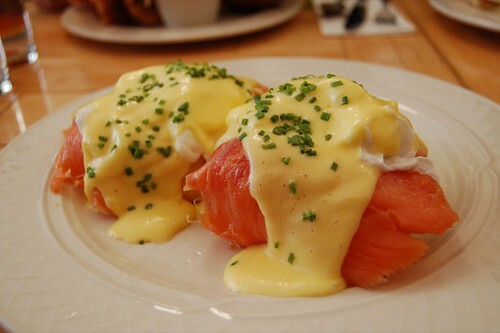 The salmon was quite succulent and moist, and it was well balanced with perfectly poached eggs and a light hollandaise. I would say that Clinton St's benedict lives up to Canteen's, though I still prefer the latter's more delicate hollandaise with that fantastic aftertaste. 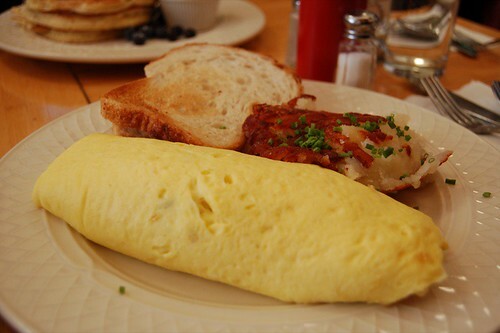 There was a bit of confusion with the omlette, for we had ordered it with red peppers and mushrooms, less the cheese. My peers found the cheese bit overpowering, with which I concurred. I was more impressed with the potato hash, which had a browned, crispy exterior and spiced with picante. 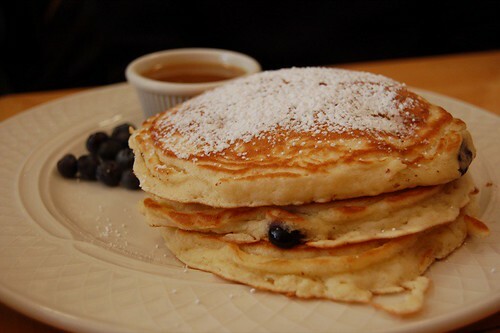 New York Mag and Village Voice have both deemed Clinton St. Baking Co as having the best pancakes in the city for the past few years. The pancakes were great, but I think their title comes from the warm maple syrup. Yes, the pancakes themselves were fluffy and the perfect texture and bursting with buttermilk flavor and whatnot, but the syrup was damned good! It really was fresh maple syrup, which is hard to find nowadays. The stack is pretty huge too. 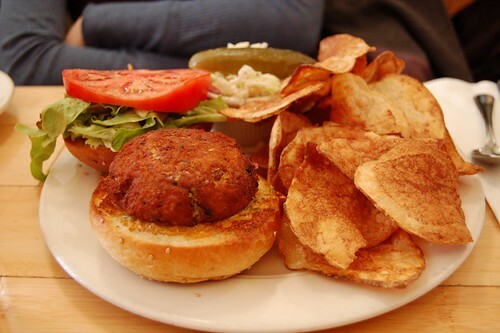 But even more enjoyable than the pancakes was the crab cake sandwich, in my opinion. Initially, I had thought the crab cake looked burnt and perhaps dry, but it turned out to be one of the most flavorful, creamy crab cakes I've had. The shreds of fresh crab were generous, the roll was toasted perfectly, and the tomatoes very insanely juicy. The chips were a bit burnt, but overall the dish was great. We were very pleased with our brunch, and we agreed that the food justified the ridiculous two hour wait. The prices were quite reasonable as well, for everything arrived in huge portions (not just by Manhattan standards, but by normal people standards). 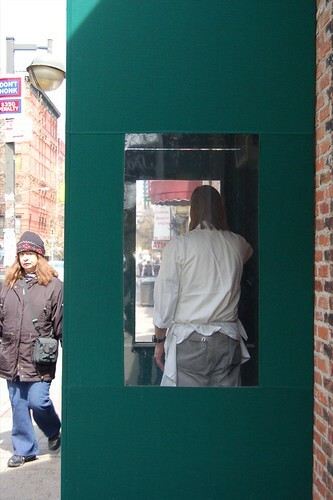 We passed by wd-50 as we were leaving and saw Wylie Defresne looking quite irate on the phone. Perhaps he was angry he had to miss brunch. I had wanted to finish all my San Francisco posts, but a semi-spontaneous visit to the city w/ N, Y, B, and J last weekend will have to interrupt that once again. After we arrived at around 8:30 and finally found parking by 9, we trotted over to Kyotofu in Hell's Kitchen for some grub. 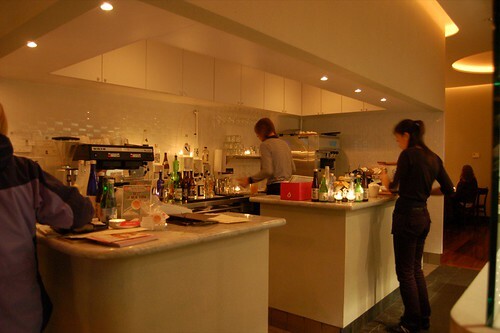 Kyotofu, which opened in November 2006, operates primarily as a dessert bar, though it now offers a limited lunch menu and a bakery. 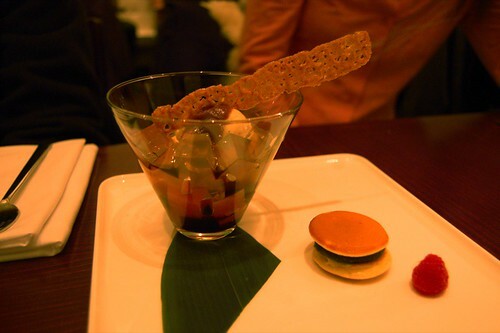 The desserts all feature such Japanese ingredients as sesame, green tea, bean paste, and would you think it, tofu. It also has a good-sized list of sakes and cocktails. The place is pretty miniature, so this is the bar with about 3 seats. 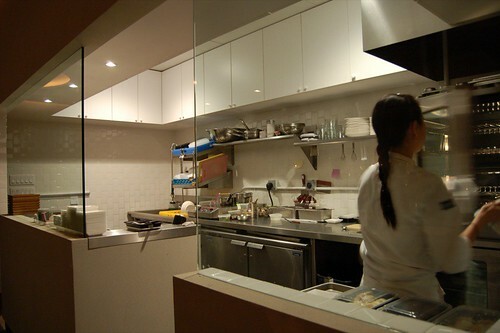 To the right of the bar is the open kitchen, where you see all the desserts and savories prepared here. It's pretty cool, but not so much when you're hungry/disgruntled and waiting for a seat. We were seated after a short wait in the dining room, a chic white room with white upholstered seats and a soft glow (and hence, my poorly lit pictures). The place was designed by the architect responsible for Momofuku and Jewel Bako, and I definitely saw these influences. 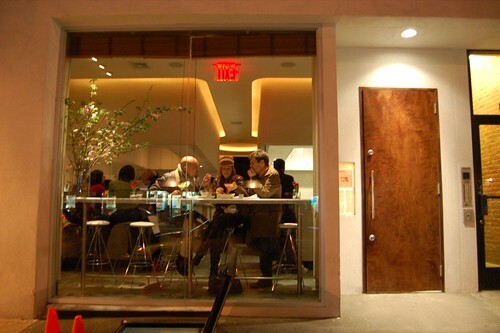 The whole restaurant is simple but elegant, upscale without being ostentatious. The Williams-Sonoma grapefruit lotion in the bathroom was a nice touch too. We all decided to order something different and share. The black sesame tofu was perhaps my favorite of the night. 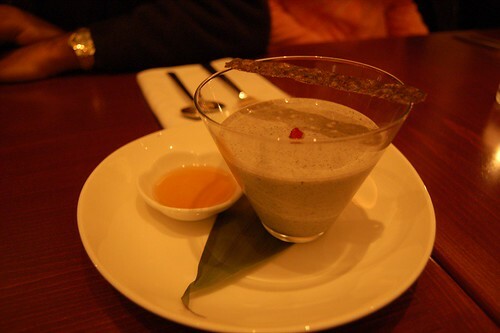 Silky and smooth, it resembled tofu-fa, the dessert one would order at dim sum, except this was infused with a hearty black sesame flavor. The tofu, just slightly sweet, did not even need the tea syrup to accentuate the black sesame. The parfait, though dense in structure, was actually quite light in taste. 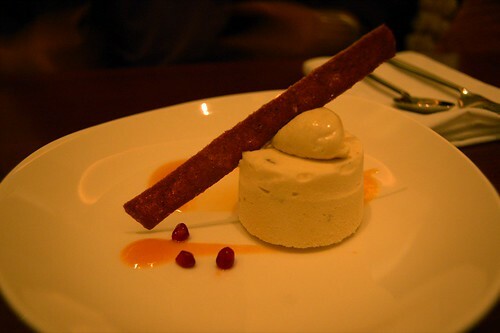 Interspersed with an abundant number of walnuts, the parfait tasted like a really light vanilla mousse. This was balanced out by a buttery bottom crust. I felt the sauce and mascarpone mousse were superfluous, and actually overpowered the nutty parfait. 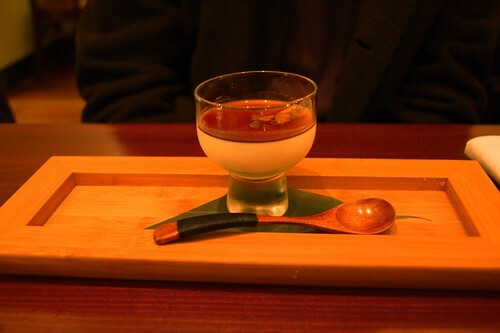 This is one of the signature Kyotofu desserts that came part of the prix-fixe dessert tasting menu. This was in fact the identical to the soft tofu dessert eaten during dim sum. Nothing too special; I would definitely skip this and get the black sesame. The desserts were good so far, until we got to this. The anmitsu, which are translucent cubes of jelly, tasted rather curious, almost like artificially plastic tasting gelatin. Perhaps I didn't get a good spoonful, but I did not taste the black current mochi; the azuki paste was mediocre at best. I did not get a taste of the doriaki (the pancake), but they say it was good. This was another rather lackluster dish from the savory menu. 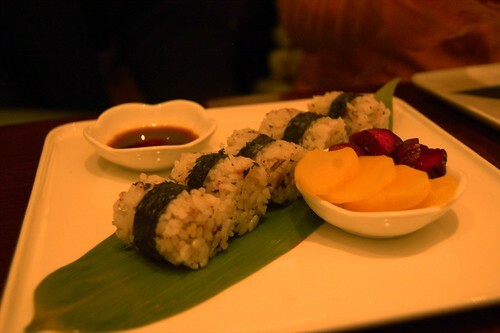 It was simply sushi rice balls rolled up in a seaweed with some pickles and soy sauce. The rice was too soft for my taste and lacked a sufficient amount of vinegar. I am not usually one to complain about prices, but this was definitely something I would not say had good value. This was the 2nd of the 3 course prix-fixe, pretty much covering everything else on the menu we didn't order. The rice pudding was pretty interesting, and tasted like fresh rice since it was pretty soft and fluffy. The ginger was too subtle for my liking, but this was one of the better desserts of the night. The chocolate cake fell into the same trap as the bandwagon raspberry & chocolate pairing. The cake itself was pretty typical as well, and was just another chocolate cake with a melty interior--it just wasn't that interesting. 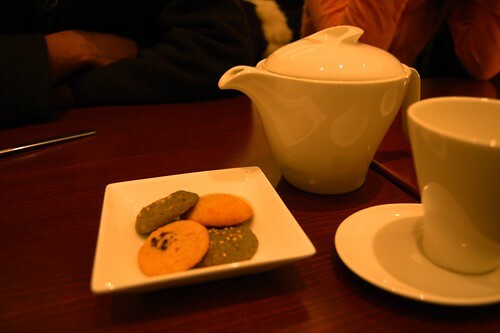 We had ordered tea at the beginning of the meal, but it arrived when our courses had all arrived. The tea itself was good, with a good peppery lavender aroma. The tea cookies were fine but not all too special. It came with two black sesame cookies, which really lacked any depth or sesame flavor, and two sugar cookies, one of which had half a side drizzled in a green tea glaze. 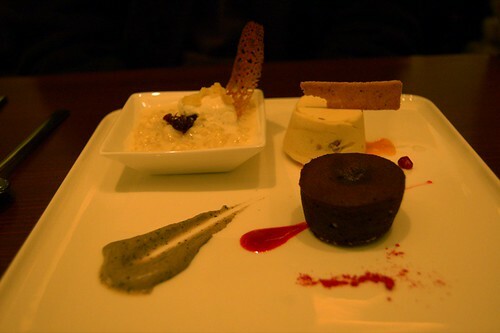 Kyotofu was a fine experience, but the desserts were a notch lacking. 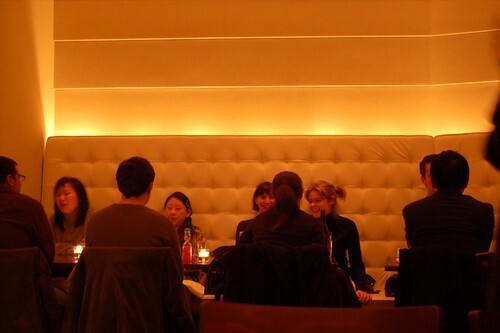 The ambiance and actual soy-based desserts (i.e. the black sesame tofu) are probably the only things worth visiting. I haven't yet tried their savory tofu lunch items, but I assume they will be tastier compared with the non-soy savory dishes. After my night of Bloc Partying and burgers, I decided it was due time for some detoxing. As my healthful mother is a major fan of Greens at Fort Mason, we headed over there for a wholesome brunch. Good thing I made reservations, or else I would have been waiting for a good while. Though, they do have Greens to Go, featuring grab-n-go sandwiches, pastries, and smoothies. Here, you will find the East Coast stereotype of San Franciscans come to life: REI/Birkenstock-types on their zero-emission bikes and sporting their uber organic attitude. But, we are talking about a vegetarian restaurant in the Marina. Greens has a limited but ever changing menu. That sunday, they had a curried cauliflower soup, which consists of 2 of some of my favorite things. The soup had a wonderfully smooth consistency, similar to a cream soup, but without the cream. 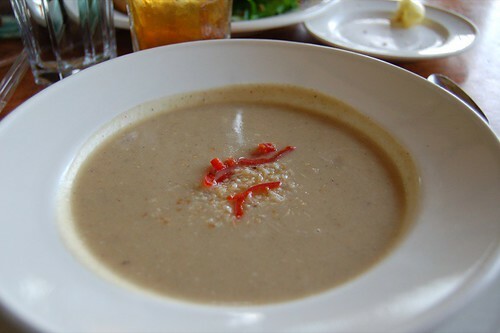 Topped with fresh coconut shavings and peppers, this soup was delightfully light way to start the lunch. It was also not the least bit salty. 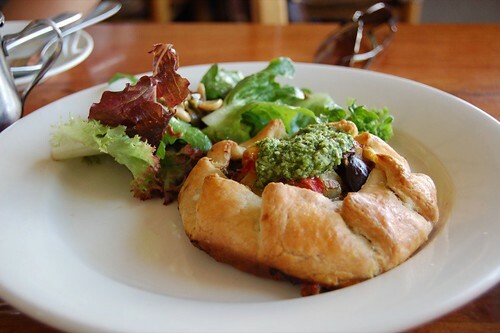 Next up was the tartlet with vegetables and pesto. The tartlet was deliciously flaky and buttery, but could have been on the heavy side if it were not balanced with the lightly sauteed eggplants and tomatoes. So far, I was quite impressed by how fresh all the vegetables were. The salad was impeccably crunchy and refreshing, tossed lightly with the lemon vinaigrette. These brochettes were great, marinated and grilled such that each vegetable component still retained their flavor. I was especially impressed with the cherry tomatoes, which were some of the juiciest, sweet tomatoes I've had in a long time. 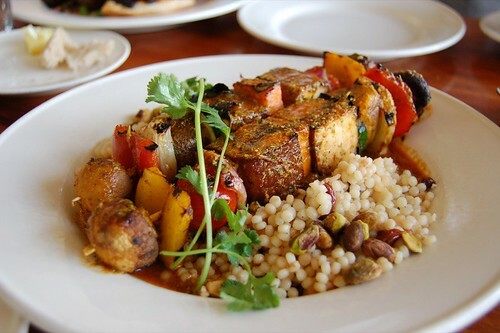 The couscous, however, was a bit too soft for my taste, though it redeemed itself with the pistachios and dried berries. 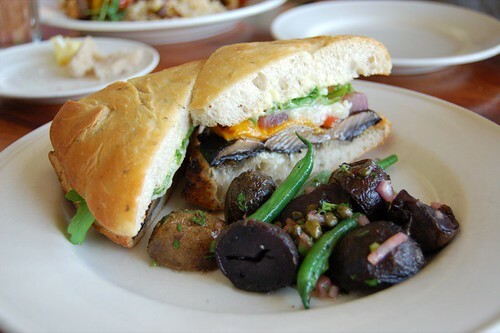 The grilled portobello was good, and it pretty much hit the ceiling of how great a portobello sandwich can be. The part of this dish that really appealed to me was the cold potatoes with green beans tossed in vinagirette. The potatoes were small and delicate, and the green beans tasted like they were just picked from the garden. This was the palate cleanser I needed that morning. 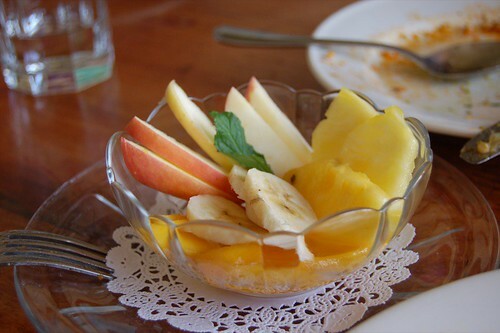 Instead of going for a dessert, we opted for a healthful bowl of fruits to end our meal. This is probably the only part of the meal I can replicate with good results. Although I tend to frown upon vegetarian restaurants because of selection issues, I loved Greens. Everything was flavored just right, and the preparation of fresh ingredients was simple, prestine, and well-executed.